IBERHUNTING offers a special hunting program: Spanish Ibex Grand Slam. This hunting package allows the hunter to live an unique opportunity to complete the Spanish Grand Slam in a single trip. Amazing days in the hunting period of november-december (rut-time) or Spring time for collecting the four sub-species of our Spanish Ibex. This program could be also combined with Balearean Boc, Cantabrian or Pyrenean Chamois or any kind of spanish game. During these days you will be guided by a professional hunter living the great experience to hunt in the recognized Spanish Hunting Reserves known for its beautiful trophies and its remarquable management. This trip will take you through much of the geography of our country and will let you know different landscapes, delicious regional cuisines, various customs and the same welcoming people in each of the places that you will visit. 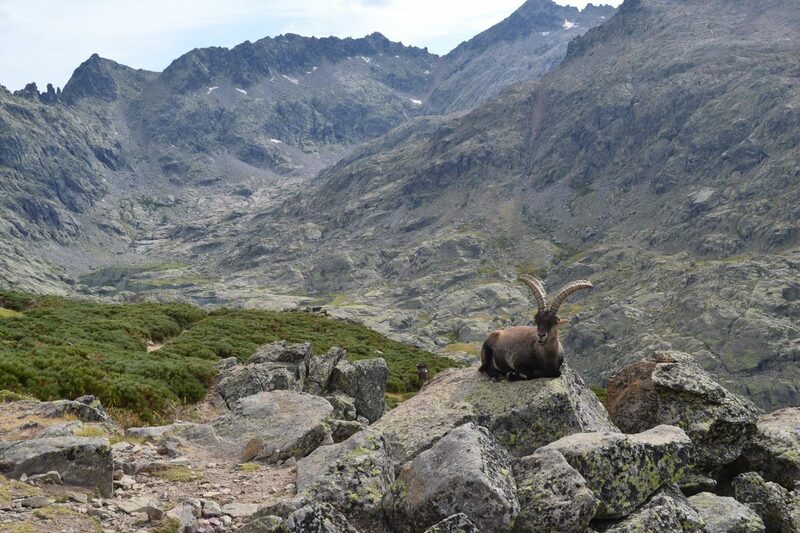 In the heart of the Iberian Peninsula, toward the West, is the Central System, a long mountain range, formed by a series of mountains, among which we find la Sierra de Gredos, located between the provinces of Ávila, Cáceres, Madrid, and Toledo, and which gives the name to this subspecies of mountain goat. Exploring gastronomy in Castilla y León means finding oneself in the epicentre of roast suckling lamb, suckling pig, and kid meat. It means having fresh beef and discovering the increased use of codfish and trout in recipes. It means discovering tradition and taste in the use of basic raw materials and farm produce. It means indulging in the sublime sweets made traditionally in old monasteries and convents, pastries which are over 300 years old. It means enjoying wine country with a rich tradition, which today makes high-end wines, all along Douro river. Los Puertos de Beceite is a mountainous massif located between the provinces of Tarragona (Catalonia), Teruel (Aragón) and Castellón (Valencia) where the Catalan Pre-Coastal Range and the Iberian System meet. Its highest point is the 1.447-meter Mont Caro (Roquetes), which is the highest mountain in the province of Tarragona. 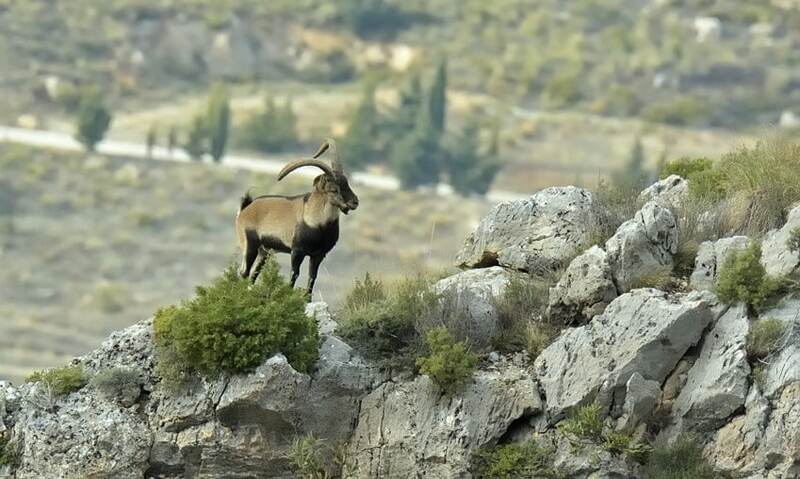 Valencia is the place to hunt the Beceite ibex. The males have thick, rough, knotty horns, and are normally in the shape of a semicircle curving backwards. In contrast to deer, they do not shed them annually, but keep them throughout their entire lives. The age of the males can be measured by the rings of annual growth. Capra Pyrenaica is an animal with great sexual dimorphism. As with the majority of mammals, this means there are ample differences between the morphology of the male goat and the female goat. They tend to divide into groups of sexes which can contain over 30 individuals: the males in one group and the females and young in another. They move easily around rocky walls of incredible verticality, thanks to the peculiarity of their hooves, whose internal surface is non-slip. Even when they are sedentary, in Winter they carry out prolonged displacements in search of refuge and shelter, climbing down to lower areas. Sierra Nevada is a mountainous massif belonging to the Baetic mountain range, more specifically the Penibetico range. This can be found in Andalusia, in the central south-east area of the province of Granada and the south-eastern part of the province of Almeria. Due to the great diversity of the landscape and its exclusive natural value, it has received several provisions for protection. Apart from being a Nature Conservation area and National Park, it is also internationally recognised as a Biosphere Reserve. The highest point is the Mulhacén peak, at 3,482m. A charming and comfortable hotel situated in the heart of the countryside will host you during your stay. There you will taste a Mediterranean, Andalusian and traditional food: the Mediterranean elements mixed with Arabic Traditions merge to create the traditional Andalusian cuisine, rich and varied dishes will captivate your taste buds! The Romans taught Andalusia how to cultivate wheat and vines and used the fish from the seas to produce the best “garum” in the empire. The Arabs taught the people of Andalusia to grow fruit and vegetables. They used irrigation systems and perfected the cultivation of the olive and the production of oil. A Mediterranean based gastronomy which is unique due to the extremely high quality of its ingredients from the sea or vegetable garden, and because of the use of extra virgin olive oil, an indispensable element which gives personality and distinction to these dishes, and is present in the quintessential Andalusian dish: gazpacho. One culinary custom which is quite a tradition in Andalusia due to the favourable climatic conditions, and which can be found all year round is the “tapa”, a great way of tasting the dishes which define the universe of Andalusian gastronomy in small portions, usually accompanied by a beer or a good local wine. In the many bars and restaurants you can try countless cold or warm, simple or elaborate, seasonal tapas. Morphologically the ibex of Ronda the smallest of the four different types of ibexes which are differentiated in our country. Brought about by an adjustment to the environment and to milder winters than those of other areas of the Peninsula, it is mainly differentiated by the scarcity of black spots on its coat. The hair is shorter, with a less abundant mane and less occipital width in the cranium. The horns grow upwards in a V shape and then backwards with a spiral twist of just 90 degrees. While this is the typical shape of the horn of the Ronda ibex, other formations may be found in this region, even within the same herd. The National Park of the Mountain ranges of Tejeda, Almijara and Alhama, which extends to 40,662 hectares, is situated on the mountainous contours of the ranges of Tejeda, Almijara and Alhama, between the provinces of Malaga and Granada. The Sierra Tejeda mountain range is the highest section of this set of mountains, reaching 2,066 metres at the peak of La Maroma. Spectacular views of the Mediterranean coast and neighbouring mountain ranges can be seen from here. The hunt itself is a classic mountain hunt that starts in the early hours in the morning. After the breakfast time, we will drive with the rangers of the Natural Park to the hunting area. Then we will continue the hunt by a silent stalking using binoculars and scopes to calculate the distance and size of the trophies. Shooting distances may be in the range of 150 – 250 meters. Recommended calibres for this hunt are 300 WM, 338 WM and 270 Weatherby. In most cases you will have time to get a comfortable rest for shooting, but sometimes you must be able to manage quicker shots. The hotel is located within the National Park of unforgettable beauty, at the shores of the La Viñuela reservoir and at the foot of the Sierra Tejeda, Almijara and Alhama National Park. Situated just 15 minutes from the beaches of Torre del Mar and 30 minutes from Malaga city. There are numerous complementary facilities available in the nearby area, such as golf courses, shopping centres, etc. On the coast of Malaga, the visitor will find an inexhaustible gastronomic selection. Smaller fish (anchovies, red mullet, horse mackerel, squid and baby squid) served fried, are a symbol of a simply elaborated yet exquisitely tasty cuisine. The prawns, clams and lobsters of the bay offer a special taste, whether boiled or grilled. We have programed this Grand Slam Ibex based on 14 days – 13 nights . This program is informative and there may be some change depending the end of the different hunts. 1st Day: Arrival to MADRID AIRPORT; transfer to Gredos hunting area. 2nd-3rd Days: 2 Hunting days for Gredos Ibex. 4th Day: Transfer to Beceite hunting area. 5th-6th-7th Days: 3 Hunting days for Beceite Ibex. 8th Day: Transfer to Sierra Nevada hunting area. 9th-10th Days: 2 Hunting days for Sierra Nevada Ibex. 11h Day: Transfer to Ronda hunting area. 12th-13th Days: 2 Hunting days for Ronda ibex. To confirm your booking we require a deposit of 50% of the cost for the hunt. The remaining balance to the full cost of your hunt has to be paid not later than 60 days before the hunting date. In case to shoot a bigger trophy the extra points would be paid after the hunt by sign of the hunting protocol before your departure. The measure of the trophies will be done “en verde” (in green) in the field by the rangers of the Hunting Reserve. Any reservation made less than sixty days before de hunting date will be confirmed by the full payment of the hunt. For the management of your Spanish licence and insurance, we will need to receive copy of your hunting licence and identity card or passport. days before the hunting date, the total deposit is forfeited. In case of cancellation of 60 or less days before the hunting date, all booked services must be paid. Injured animals which can’t be found are considerer to be shot and must be paid by the customer. For getting your Spanish hunting licences, we would need to receive copy of your passport and current hunting licence.